It’s the Beyoncé-Adele Super Bowl you’ve been waiting for. Albums can drop from the sky at any time in the middle of the night, but luckily, knowing when to expect how they’ll be criticized by music’s overlords isn’t half as much of a surprise. Judgement Day has arrived: The nominations for the 2017 Grammys are here! 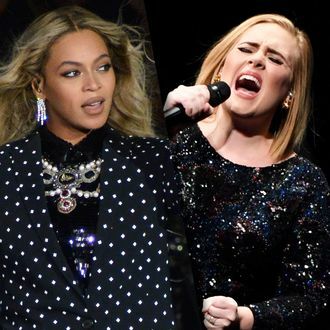 Just as we predicted, it’s set up to be a Beyoncé versus Adele matchup, with both artists up for the big categories, including Album of the Year. Drake, Justin Bieber, and Sturgill Simpson also round out the Album of the Year nominees. Beyoncé leads the noms with nine, followed by Drake, Rihanna, and Kanye West at eight. James Corden will host the 59th Annual Grammy Awards on February 12 on CBS. Vulture will have our analysis of the nominations shortly; for now, see all the major contenders below and get the full list of nominees here.